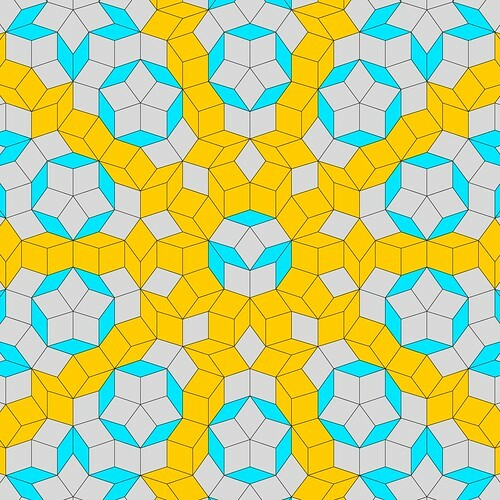 If you're here, you're probably considering making a quilt from a Penrose tiling. Congrats! 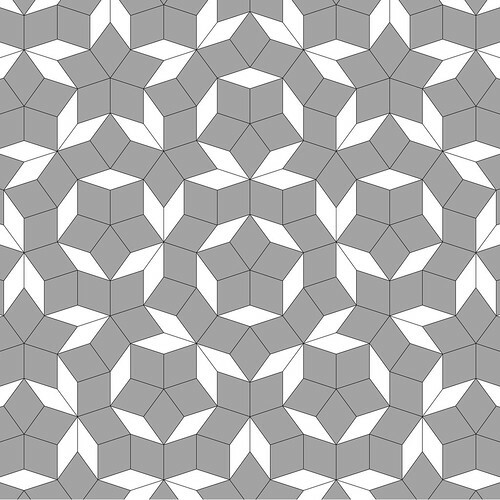 An 'aperiodic' tiling first written about by Sir Roger Penrose in the 1970s. 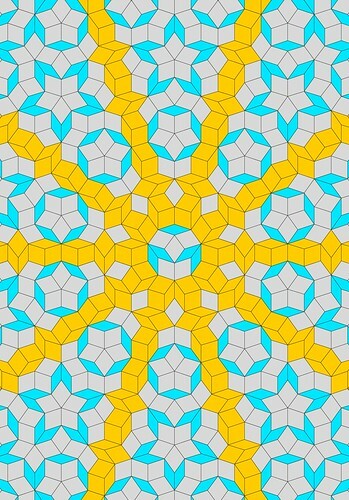 (see 'Penrose tiling' on wikipedia) Quilting, for the most part, celebrates 'periodic' tilings -- patterns with a regular repeat. 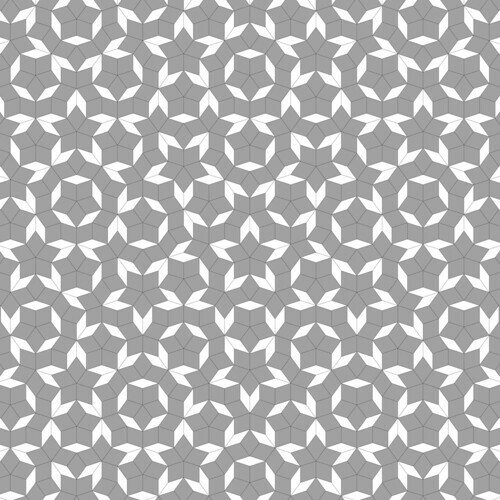 Aperiodic tilings (wikipedia) start from a central point but never repeat, not completely; as they grow outward, they fracture and split and form aesthetically satisfying patterns that never fully repeat, but have radial symmetry from that central point. 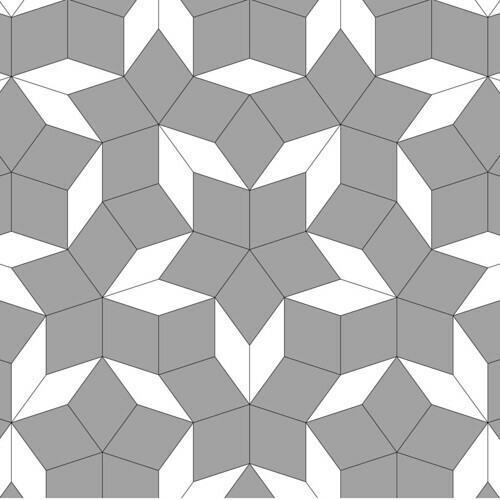 Penrose tilings have five-fold symmetry, meaning you can draw five lines out from the central point and each section will be the same. 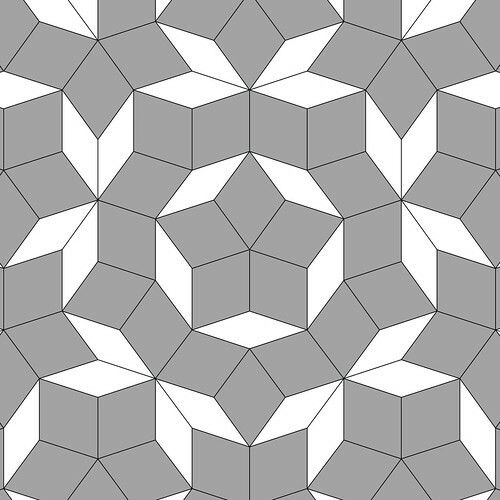 Technically, there are two versions of the tiling: the 'sun' and 'star' tilings. They're named for the pattern they begin with in the very center of the quilt, though as they grow outward, they look essentially similar. There's also a variant with different symmetry, called the 'cartwheel,' which I'm including because it is different and also beautiful. 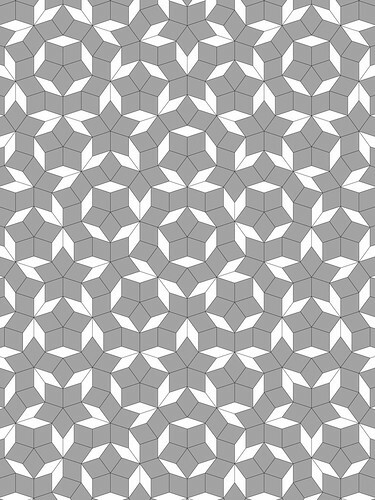 You may get growled at by a mathematics professor if you claim the 'cartwheel' tiling is a Penrose, though -- be forewarned! Absolutely. I've tried to ensure that all of the tools you need to start are linked from this page. There's no time frame. To me it is infinitely more valuable that you're making an effort to learn something new, stretch your skills, and make something beautiful. Learning is lifelong. Got one you want me to show? Contact me - http://domesticat.net/contact - and share a Flickr link. I'll add it. Bloody hell, that looks hard. Why should I try it? ...because it's hard, and because it's beautiful? Could there be better reasons? If you're not daunted by English paper piecing, or sewing hexagons with their small individual seams, you can do a tiling quilt! The problems are similar. The difference: you'll need to choose which version of the tiling, and which section of it, you want to do. 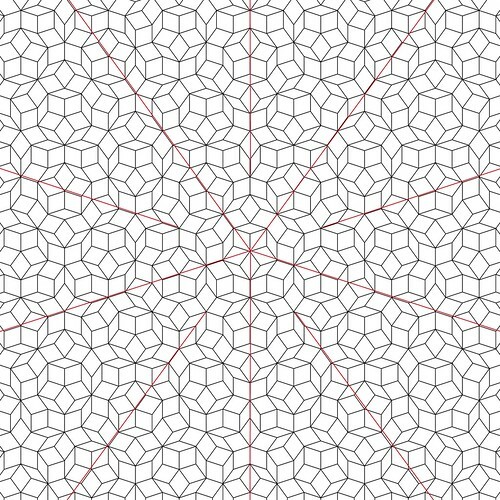 Aperiodic tilings grow outward forever, so you have to decide where to cut off the pattern, and how you want to center it. This will be your design project from start to finish. 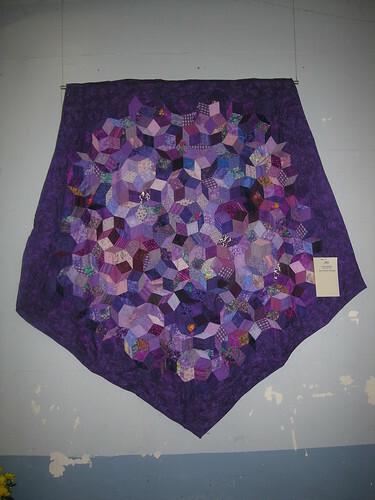 When you're done, it's very likely there will never be another quilt just like it -- ever. If that last sentence makes your toes curl, just a little, this project is for you. My patterns are sized for 3" pieces. The "fat rhombs" are 72-degree diamonds. Get them at paperpieces.com. The "skinny rhombs" are 36-degree diamonds. Get them at paperpieces.com. 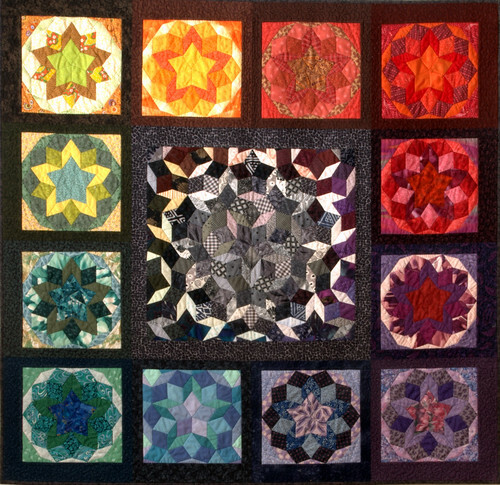 If you are comfortable working with .ai, .svg, or .pdf files, I've included all three in my entry "Penrose quilting?" from 2010. What size quilt do I make? Here's the fun and scary part: it's up to you! 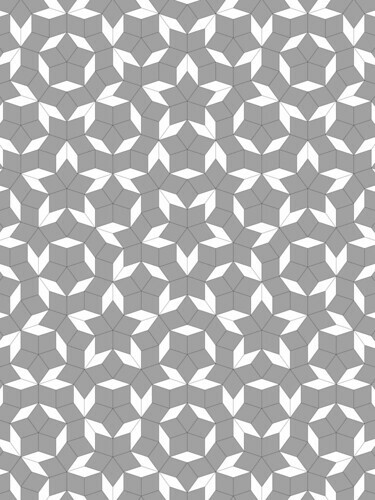 The idea behind an "aperiodic tiling" (which Penrose tilings are) is that it doesn't ever repeat, not fully and cleanly, so there's no clean, obvious place to place the edges of a quilt. I've set a base piece size of 3", and tried to generate some blueprint ideas for quilts that matched standard quilt sizes but also showcased pattern sections at their best. You'll have to trim the edges of the quilt top when you're done to get a clean edge. Pick the tiling, and the size quilt you want to do, and download the original size of the image and print it out. Take care to ensure the image doesn't get rotated or cropped when you print it. If you have trouble deciphering the pieces at the edges, print out the next bigger size too, so you can look at it to see how the outer edge pieces should fit together on your top. * Yes, I know it's a variant, but it's gorgeous! 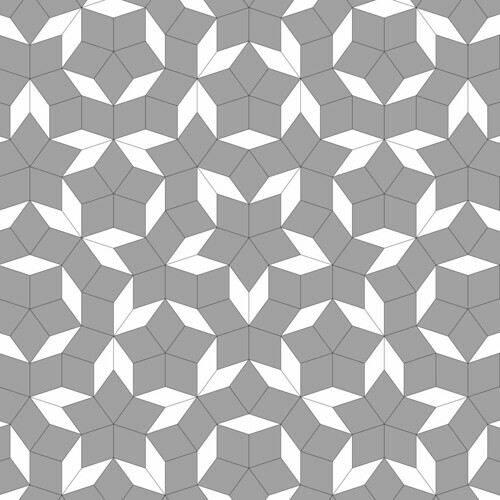 For those of you more technical, the "cartwheel" tiling does not have fivefold symmetry; it only has left-right symmetry. If you draw a vertical line through the center of the tiling, you'll see it. I saw your request on English Paper Piecing and had to see what this is about. It is fabulous and I have to try it. Yay! I've been delighted by the number of people who have said that very same thing. 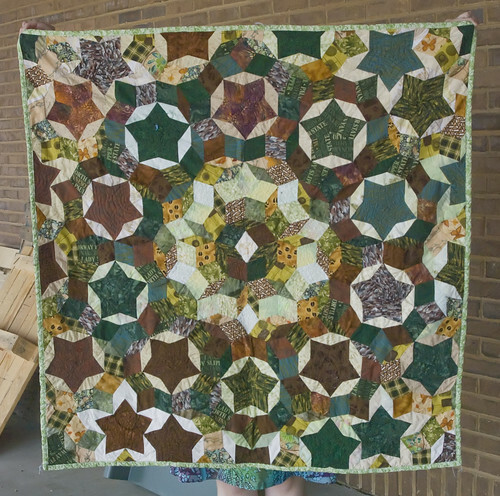 For a while I thought I was the only person interested in these things, but it turns out there are quilters who either didn't know about aperiodic tilings, or didn't know how to generate the pieces they needed. Hi there, I'm popping over from Flickr too. It looks wonderful, I think I'll have a play with a protractor and graph paper, ooh I haven't felt this happily geeky in aaaages!! I came over from Flickr also. I came over from Flickr also. I love the way these designs look. 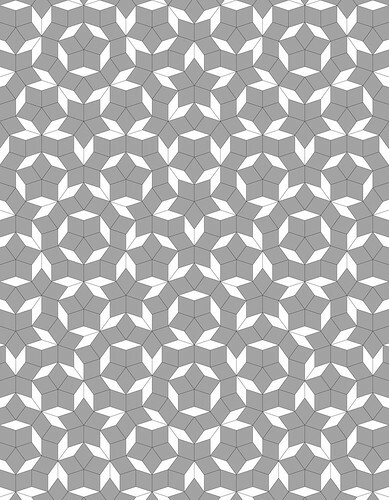 I would be very interested in making a couple of the 25" Sun tiling designs. I like to use freezer paper for my EPP. Is there an online templete I could print? I've been looking for a new interesting EPP project (like I need a new project) and this looks pretty fabulous. Thank you so much for providing the templates to print. Hiya! I've got some pictures of mine (a 2-year-old work in progress) over at my blog here. 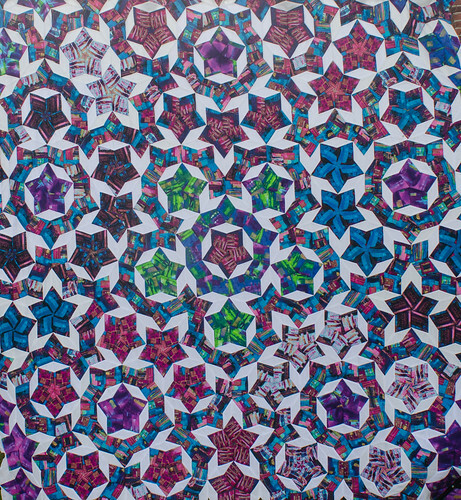 I just completed the quilt challenge based on the P2 tiling, and posted them on Flickr. I must have visited this site at least 10 times while I was planning, and I'm grateful to have had your example for inspiration - thank you very much for writing about this!